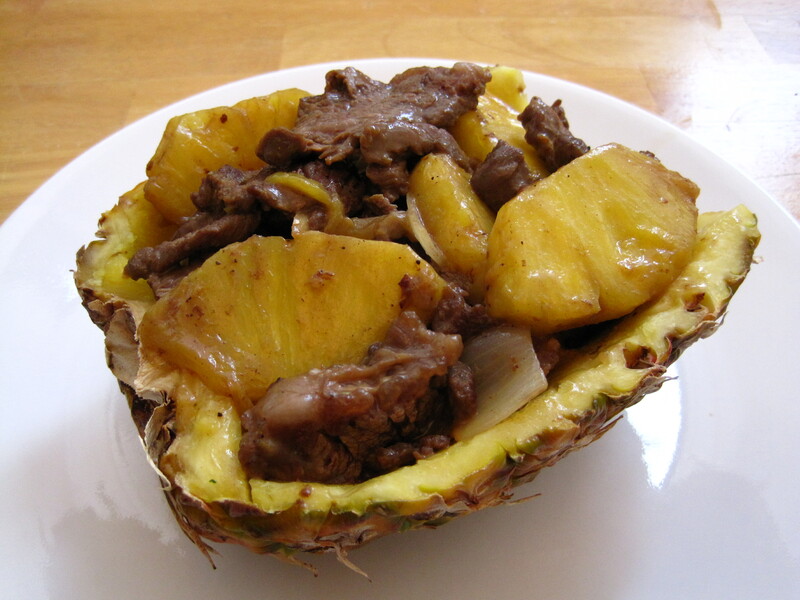 Pineapple beef is a delicious and simple Cantonese (Chinese) dish. We order this often at Magic Wok – one of our favourite restaurants in Markham, ON. But it’s really easy to make at home; you just need a very good quality, ripe pineapple. I made this dish again recently using an organic pineapple and my family and I agreed that it was the best pineapple we had ever had, and it made this dish incredibly tasty. If you carve a pineapple boat (which is also really easy to do), this is the perfect dish to serve to guests. Note that the pineapple bowl looks prettier if you keep the leaves on, but I was in too much of a rush when I was making this. Just be careful when you’re cutting through the stem because it can be tricky and the leaves are sharp. If you want more colour in this dish, you could cut half of a green pepper and half of a red pepper into chunks and add them to the wok shortly after you’ve started cooking the beef. Mix the sliced beef with the soy sauce, shaoxing wine, oyster sauce, cornstarch and pepper and marinate for at least 30 minutes. If you’re not carving a pineapple boat: Using a large knife, cut off the top and bottom of the pineapple and carve off the skin. Cut the pineapple lengthwise into four wedges and cut off the core from each wedge. Slice two wedges into 1/2 inch thick slices and use only the larger slices for this dish. Reserve the remaining pineapple for another use. If you are carving a pineapple boat: You can keep the leaves on (looks nicer) or you can cut the top off (easier). Either way, cut the pineapple in half lengthwise with a large knife. I used a cleaver and I started cutting from the bottom up, that way I was cutting the leaves from the bottom up and avoiding the pointy sharp ends for the most part. Using a sharp paring knife, cut all the way around the pineapple along the skin, 1/2 inch away from the edge, without cutting through the bottom of the pineapple. Angle the knife slightly towards the centre of the pineapple. Then cut a V down the middle of the pineapple to remove the core. This will leave you with two long wedges of pineapple. Cut along the bottom of the two wedges from the space that you made by removing the core. Remove the two wedges of pineapple whole and slice into 1/2 inch thick slices. Use only the larger slices for this dish and reserve the remaining pineapple for another use. Heat a wok over high heat. Then add 2 tbsp vegetable oil and heat until it is almost smoking; this will take just a few seconds. Add the pineapple slices and stir fry occasionally until starting to carmelize, about 1 to 2 minutes. The pineapple should not be too soft or watery. If it’s watery, the heat is not high enough. Dish out and set aside. Add 1 tbsp vegetable oil and add the onion and ginger. Stir fry for 30 seconds and add the beef. Stir fry until almost cooked through, about 2 minutes, and add a pinch of sugar and 4 tbsp of beef broth or water. Once the sauce is thickened, about 30 seconds to 1 minute, add the pineapple back in and give it a few quick stirs. The beef should be just cooked through and the onions should still have a slight crunch to them. This dish should not be saucy. Plate in the pineapple bowl or on a large dish and serve immediately with rice.